For reasons best known to themselves, the producers of this laborious comedy chose the line immediately preceding that in the Elizabeth Browning poem for the title of this film version of Peter DeVries's novel Let Me Count the Ways. 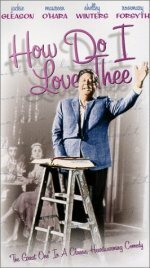 Jackie Gleason was perhaps not the most fortuitous choice to play an unrepentant atheist in keen debate with his philosophy professor son, as anyone who has seen the deadly dull Nothing in Common will know. Maureen O'Hara and Shelley Winters do little more than referee this talkathon, which is all-too-rarely worth listening to.